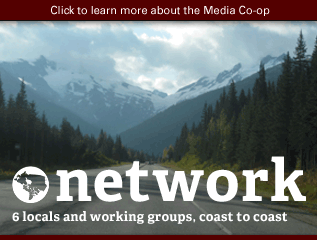 The Media Co-op is a coast-to-coast network of local media co-operatives dedicated to providing grassroots, democratic coverage of their communities and of Canada. 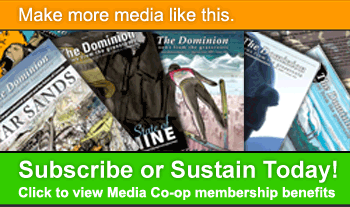 The Media Co-op network also publishes The Dominion, a bi-monthly grassroots news magazine. 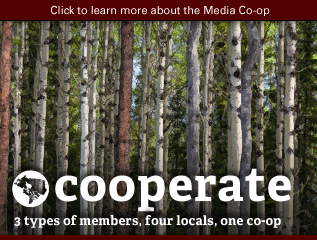 The majority of the content on the Media Co-op website is generated by our members; other posts come from non-members. 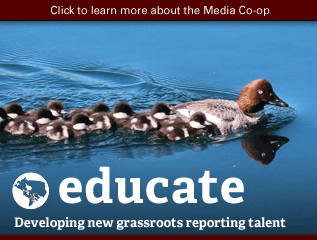 Content on Mediacoop.ca is organized on the site in the following categories: Blogs, Photos, Stories, Events, Audio, Video and News Releases. In addition to our open publishing site, we feature articles that have gone through an editing process, which are posted to the site as Dominion stories. 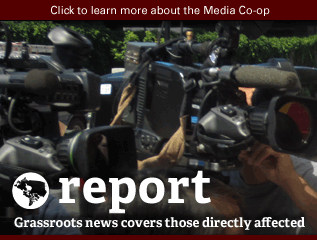 All content posted to Mediacoop.ca is subject to our online editorial policy. By posting to the site, you are agreeing to the editorial policy outlined in this document. The Media Co-op is based on open publishing, so any content published by a user appears immediately on the site. 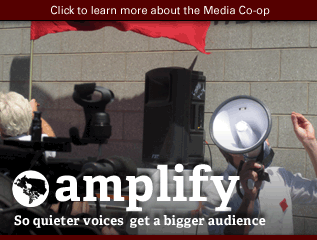 All content posted on Mediacoop.ca is then moderated by the editorial collective. The editorial collective has final say over all content appearing on the site. Editors can feature, top story, hide or unpublish content posted by users. Content posted to local sites, like halifax.mediacoop.ca or toronto.mediacoop.ca, will be moderated by that local’s editorial committee and not by the national editorial collective. The following information applies to MediaCoop.ca but not necessarily to all of the locals. Unreviewed posts appear in the right-hand column of Mediacoop.ca; this is where posts are published immediately after posting. Posts in this column either have not yet been reviewed by editors or are posts that are not deemed to meet the guidelines for featuring. Featured posts appear in the left-hand column on the front page of the Mediacoop.ca. 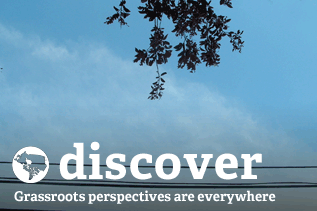 These are posts that Media Co-op editorial staff have chosen to feature for higher visibility. These may include articles, blog posts, video or audio pieces. Featured posts also include announcements from the Media Co-op, such as the calls for pitches. Top Stories appear at the top of the website's front page. These are stories which we want to draw attention to because of their quality and relevance. This may be an exceptional story or breaking news posted to a blog, or an article produced with the support of locals. Articles from The Dominion always appear in top stories. Dominion articles are paid for by our members and go through an editorial process which includes fact-checking. 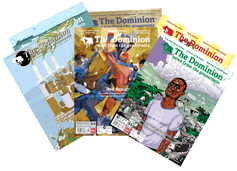 Content in The Dominion magazine is selected by editors based on reader input and pitches from writers. Hidden posts are posts which do not meet the minimum standards for mediacoop.ca. The post does not appear on the front page but is still be accessible on the site at a private URL. 1. When will the Media Co-op feature my post? Meeting these criteria does not guarantee that your post will be featured. 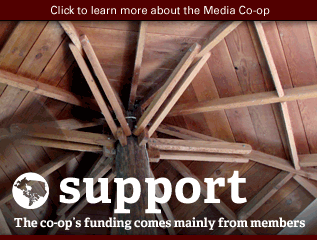 If you feel that your piece posted to mediacoop.ca should be considered for featuring, do email us at info [at] mediacoop [dot] ca – we may have missed it. Users whose posts have been featured twice become “contributor members.” Members are given priority consideration when we are selecting paid pitches to The Dominion. 2. 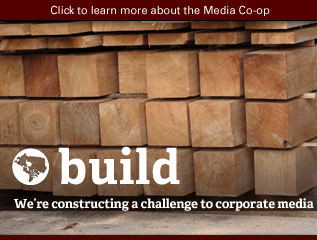 Will the Media Co-op edit my blog posts? No, the Media Co-op does not edit blog posts, other than to make minor corrections (typos, grammar) before featuring it. The Media Co-op may alter the location of your post. For example, if you check off every single local instead of just one, we will change that so that your article only appears on the appropriate sites. 3. When will the Media Co-op hide or delete my post? The Media Co-op may hide your post if we find its language or content objectionable. The post will no longer appear on the front page but will still be accessible on the site at a private URL. If this happens, you have the option of editing it to remove offending content, and then sending a request for it to be re-posted or re-featured. Be aware that the Media Co-op is unable to engage in an editorial process with you. We encourage you to get in touch with your local if you are interested in clarification and support for your writing. The Media Co-op reserves the right to hide, delete, or unfeature any content on the site. Although all efforts will be made to communicate with users in good faith, the Media Co-op reserves the right to make such changes without explanation. The Media Co-op also reserves the right to delete user accounts which consistently violate the above standards. Generally, the Media Co-op will not hide blog posts for style. You are welcome to write as incoherently as you like. Conspiracy theories and rants do not meet our journalistic standards and will not be featured. However, we will do our best to give writers the benefit of the doubt, and we only delete or hide content that we consider offensive or harmful. Disclaimer: Media Co-op editors cannot always read and moderate all blog posts. If you see something on the site that you think violates our mandate, please let us know. 4. What does the Media Co-op consider “offensive language”? The Media Co-op makes every effort to abide by principles of self-determination in language and naming. This means, call individuals or groups by the names they ask you to use. If you are unsure, educate yourself about language. Sometimes, members of the same social group have conflicting preferences. If you are interviewing someone, ask them what name, title, description or pronoun they would like you to use when referring to them. Avoid terms like, “illegal immigrants,” “criminals,” or “peaceful/violent protest,” which convey a moral judgment without actually telling a story. Tell us the story. Who is the person, where did they come from, why don't they have citizenship status? What, specifically, did or didn't happen at the protest? Nobody gets everything right all the time, but the language you use in your writing is your responsibility. When possible, we'll gently remind you to check your language, or allow other readers to point out their concerns. An article loaded with offensive terminology may be hidden, unfeatured or unpublished.